Organochlorine pesticides have been extensively used for eradication of pests in an attempt to increase food security. They are also used for control of vectors that spread infectious diseases. Pest outbreaks and spread of infectious diseases is dominant in tropical countries, such as, India, characterized by high temperature and humidity. This has consequently promoted indiscriminate use of pesticides. Environmental conditions in tropical countries are also conducive for rapid dissipation of toxic pesticide residues from their point of application. Despite the ban on organochlorine pesticides, these are still being used illegally. Due to large-scale production, extensive usage and persistent nature, presence of pesticides is reported throughout the environment, in air, water and soil/sediments. Pesticide residues have also been found both in the Arctic and Antarctic as a result of global distillation. The fate of pesticides is affected by their physicochemical properties, the prevailing environmental conditions and the geographic location. Pesticides may get volatilized into the atmosphere through aerial drift, may enter surface water bodies in dissolved and particulate forms with run-off and may also leach through the soil to contaminate groundwater. Pesticides may get partially transformed through chemical and biological processes. Lipophilic pesticides and their residues have been linked with dramatic population loss in some organisms due to bioaccumulation within tissues and interference in functioning of the endocrine system. 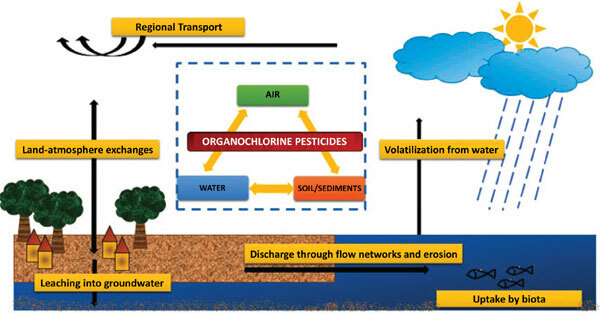 This paper attempts to elucidate the fate of organochlorine pesticides in the environment, inherent toxicity and transport and transformation mechanisms that affect their behaviour in the environment. Bioaccumulation, biomagnification, carcinogenesis, endocrine disruption, fate, toxicity.